Rackmaker Topdress contains complex proteins and essential nutrients necessary for maximum antler development. Rackmaker Topdress allows you to feed a base feed, like Heartland’s Redoy Formula, year round to all your animals. 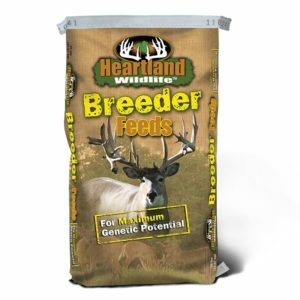 This will maximize overall feed consumption without feeding antler-growing nutrients to does and fawns. Rackmaker Topdress maintains or improves the vitamin-mineral balances of your base ration. This feed is an easy way to increase intake of vital antler growing nutrients. The amount fed depends on the total protein level desired. Below is a chart to help figure feeding rates. If high protein, high quality hay or browse is fed, you can adjust the topdress to lower intake levels.